We've been Playing with Pattern in Tile Design this month and shown you how Simple Patterns are Powerful! There's no doubt that patterned cement tiles are a great way to add style to any room. Today, I want to share a few design secrets on how to effectively use patterns. First, ask yourself if are you a pattern addict or a wall flower? It's OK to swing both ways, too! Sometimes the room's design dictates what to do! If you are a pattern wallflower, then you are pattern shy. If you are timid with patterns, it's best to choose just one pattern that you love and design the whole room around it. For example, you might start with a bold Cuban pattern rug and then choose fabric with similar colors and design elements. Remember, colors don't have to match exactly, they just need to be close enough for your eye to tie it all together. This space is designed around the cement tile rug. The blue striped pillows are nice accents to the blue in the cement tile rug. However, they are not an exact match. The dark finish on the coffee table picks up the dark roast color in the tile. 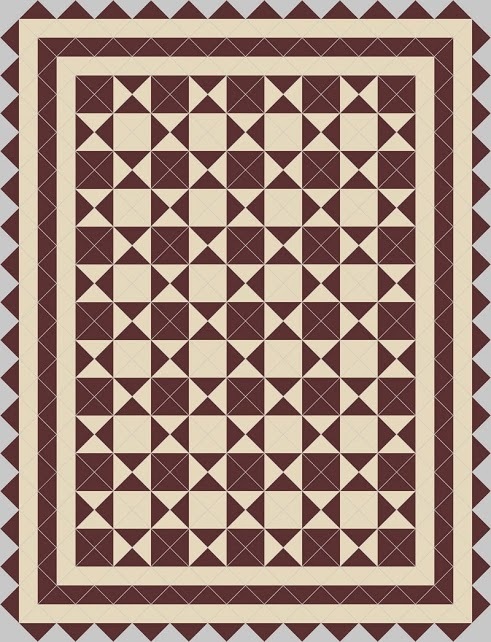 Did you notice that you can even put a carpet over a cement tile rug to break the pattern? The room and floor still look great because the sitting area is defined! Let the pattern make a statement with a bold design. Think about a kitchen backsplash or entry. There may not be a lot of space, but can completely transform an otherwise common or dreary area with a bold patterned tile. Cuban Cement Tile Patterns are a great choice for the pattern shy. You need to start any design project with a clear concept of the tile pattern, color and size because such a strong design element will influence other parts of the design. These bold Cuban tiles brighten the entry. In the project above, did you notice how the yellow walls and red stairs tied the entire design together? Repeating the color reinforces the design and makes the space cohesive. This small entry is less than 60 sq. ft.; but, the bold design packs a powerful punch and becomes the center of attention. Remember, if you are timid or new with patterns, choose just one pattern that you love and design the whole room around it. With their strong patterns, bold colors, and use of borders, our Cuban cement tiles allow you to easily make a statement with a bold design. To learn more about cement tile pattern, see our cement tile design ideas. Next week, I'll share Cement Tile Tips for the Pattern Addict! You'll be a pattern pro, just stay tuned. Patterns establish the mood of a room – just like color. However, they add complexity to the design because they need to work effectively with color to maintain the mood and feel. It’s more difficult to create an effective pattern and color palette than just choosing colors. Cement Tile Patterns establish the mood of a room like color. This commercial application uses a classic and straight-forward black and white color palette with a basic "on point" pattern. The lounge area at this Caribbean resort is just off the main lobby and establishes the right mood for this adults only five-star resort near the beach. The colors and pattern really establish a mood for the room that is slightly, formal but still fun. The high contrast colors found in a checkerboard pattern evoke playfulness and fun. No doubt, they can also be very formal. But here, they conjure images of a large ballrooms, dancing, and romance. The "On Point" Pattern has a playful approach to design. The colors - black and white - help maintain a classic, traditional feel. The pattern itself is playful - it creates the checkerboard pattern using squares that contain both colors. Patterns soften hard corners and make decorating nooks and crannies easier. However, a skilled and knowledgeable installer, and good layout, are the key to a professional design. Patterns can soften hard corners. Cement tile is a handmade product and you should be prepared for variation in color - especially white. Look at these tiles closely. 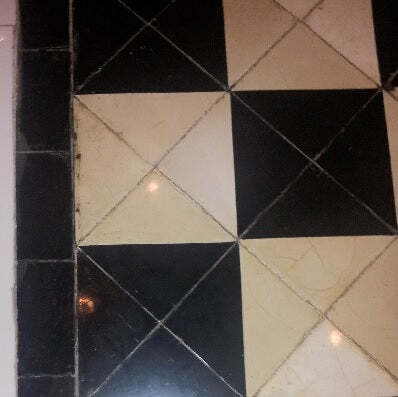 See the variation in color of the white in theses tiles? The color varies from a light tan to bright white depending on which tile you choose. The color is impacted significantly by the sand or silica used in the mixture and can vary. You may also see some surface crazing or veining. 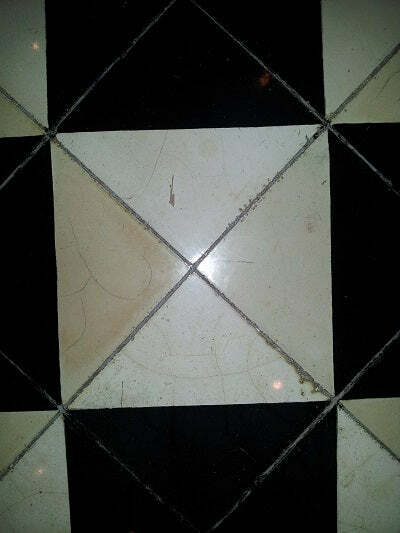 This is also common for light colored cement tile and should be expected - especially over time. It's actually this color variation that makes cement tile so beautiful when you view the entire installation. The subtle differences in color from each handmade piece create a look that is both unique and complex. As we play with pattern this month, let's explore how powerful simple patterns can be. Look what you can do with our "On Point" pattern and a few plain tiles. Here's another example of what you can create using this design. Pretty amazing, don't you think? The power of pattern! What are you waiting for? Go play with pattern! 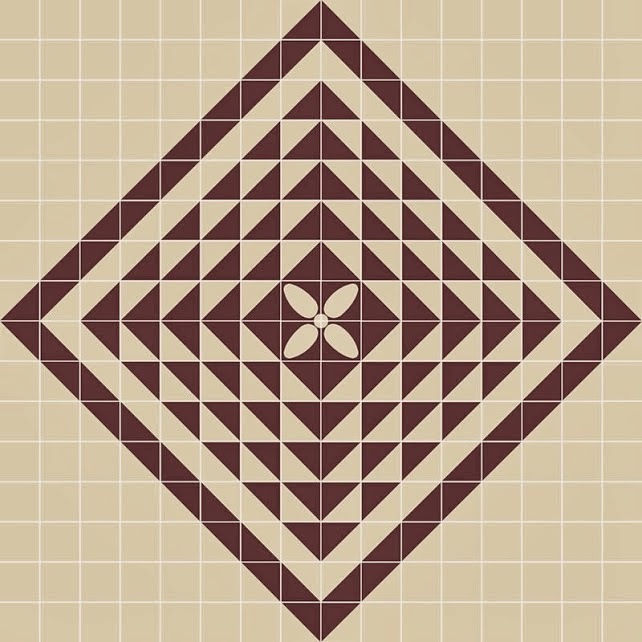 Play with Geometric Pattern Tiles! Click Here. 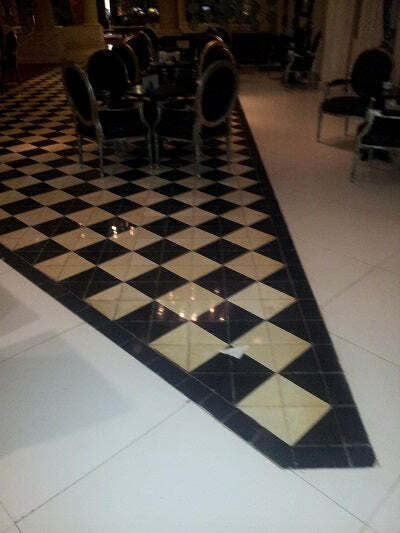 See More Geometric Pattern Tiles! As we explore pattern and tile design this month on Tile Talk, I’d like to start by introducing some of our newest Arabesque cement tile patterns. Arabesque is a unique line of Spanish floor tiles or pavers that can also be used on walls, too! The collection pays homage to a deeply rooted, rich heritage of traditional Moorish and Spanish tiles that feature interlaced geometric patterns. Patterns are decorative designs on the surface of materials that usually have a repeating design motif. When you see pattern from afar, the motifs become so small that you no longer see them as single elements; rather, you perceive them as texture. Take a look at this pattern. Can you see texture? This is an example of "visual texture." It refers to an implied sense of texture or depth created through the use of artistic elements of line, shading and color. Patterns can also utilize a non-repeating design motif, as seen below. Although the shape repeats, the random color of this Saltillo-looking color makes the pattern very playful, sophisticated, and fun! While pattern refers to recurring visual events or motifs, they can exhibit visual texture, as well as true texture. Texture refers to the tactile quality of the surface - what you feel when you touch the tile. One of my favorite colors, Normandy Cream, uses a variety of texture and hue to create an antique look. I hope you have enjoyed a quick look at some of our newest Arabesque Cement Tile Patterns, and how they can play with patterns while introducing texture. 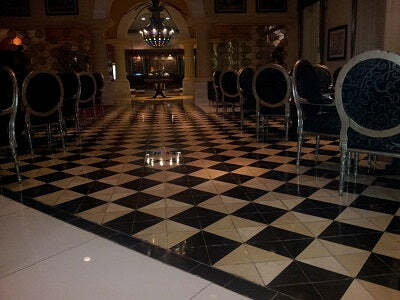 Our Arabesque Paver Tiles differ from traditional cement tile. They are made with a soft mold. Traditional patterned cement tiles are made the old way with a steel mold and the color layer is only in the top 1/8" of the tile, whereas Arabesque Paver Tiles have true through-body color. The texture, feel and style of the tiles is also very different, including the color. While both tiles are handmade and will have some variation, classic cement tiles have a more traditional, slightly formal, sophisticated look that works well for creating a multi-color pattern using the face of the tile. The cement Arabesque Pavers have a rustic feel with a softer defining edge, and have only one color throughout each tile. With so many sizes, shapes, and colors to choose from, this is one tile you can't get enough of! Handmade rustic cement tiles can be used on floors, walls and both interior and exterior locations - even those subjected to freeze/thaw cycles. Handmade appearance for a rustic look. True "through body" color. You can't scratch, cut or remove the surface color layer. Follow these easy steps to make sure you find the right tile for you! Pick a color. With over 50 different color and blends, it's easy to find a color that works with your design scheme. Choose from our Classic, Premium, or Signature colors and blends. Make sure to use the Paver Palette Colors. Add texture, if you want. Tiles comes with a standard smooth finish; but, additional textures are available to create a weathered, antiqued patina. Textures are listed below the Paver Palette Colors. Find a format and size. 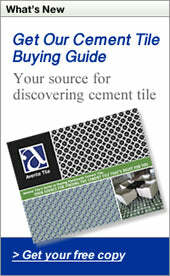 You'll find prices, sizes, shapes and colors for our Arabesque Cement Tile! We have octagons, hexagons, pickets and more! Looking for shapes that are rectilinear? No problem! Square and rectangle formats are available from 2" to 14". You'll find prices, sizes, shapes and colors in our Rustic Paver Price List. The natural world and everyday common objects can be the inspiration for decorative patterns. Patterns increases visual excitement by enriching the surface they adorn. Patterns are decorative designs on the surface of materials that usually have a repeating design motif. When you see pattern from a great distance, the motifs become so small that you no longer see them as single elements, but perceive them as texture. Patterns are fun. Patterns create comfort. Patterns add interest. Patterns can have meaning. We love pattern and tile. Tiles are great way to add pattern to your style. You can create patterns with plain tile, like the tessellation (pictured above) with three different glazes on a plain diamond-shaped tile. In fact, we're dedicating March to playing with pattern! Patterns have been part of human life since it began and they are still present everywhere today. From Pueblo pottery and Maori tattoos of the past; to fabric and architecture of today, patterns are a part of our everyday lives and often have cultural or religious significance. And sometimes, they are just fun or interesting. To learn more about tile, patterns and design, make sure to subscribe to our blog. It's published weekly and this month, we'll be playing with pattern in each issue. We hope you join. With record-breaking weather this winter, it's hard to believe that Spring is just a couple of weeks away. But as eternal optimists, we're looking ahead to the greener, colorful season where every living thing seems to rejoice in the coming vernal equinox. This month's Pinboards focus on seasonal changes where, just like nature, we're bursting for changes in designs, patterns and colors in our homes and businesses. With our "See a Pattern?" board, we're served with daily inspiration on mesmerizing, peaceful patterns that can influence the designs of textiles, fabrics, and tile. And with our "Color: Green" board, we.re reminded of the joyful possibilities that only Spring and the color green offers! From classic stripes to geometric arrays to those of centuries-old patterns, such as Moorish, Victorian, Tribal, Spanish, etc., there's no doubt we are fascinated by movement, forms and shapes. Our Traditional handmade Geometric Cement Tiles can add either a subtle or bold touch to any setting, while our San Cristobal handmade cement tile pattern offers a more muted, classic pattern. To emulate a Mediterranean atmosphere, consider using our Clay Arabesque Ceramic Tile collection, which pays homage to its Moorish and Spanish tile roots with its geometric shapes. Or, to add historical intrigue to your design, consider our Barcelona La Ermitta hand-painted ceramic tile, which boasts centuries-old Spanish patterns and Majolica glaze techniques.